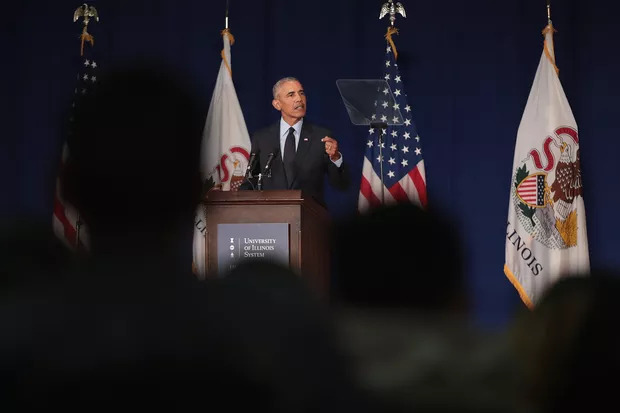 Appealing to senior voters, President Obama today defended his Medicare and social security policies, while claiming his opponents would slash the popular entitlement programs to give tax breaks to the wealthiest Americans. And today is especially poignant for me I think because I can’t help to think about my grandmother, Madelyn Dunham. During World War II, she worked on a bomber assembly line, with a baby at home, while her husband was off serving his country. And in the postwar years, she worked her way from a secretary to vice president at her local bank. And later, she helped raise my mother, and then obviously helped raise me and my sister. She was a great citizen who lived up to her responsibilities. And after a lifetime of hard work, what she hoped for in return was to be able to live out her golden years with dignity and security, and to see her grandchildren and her great grandchildren have a better life. There’s been a lot of talk about Medicare and Social Security in this campaign, as there should be. And these are bedrock commitments that America makes to its seniors, and I consider those commitments unshakeable. But given the conversations that have been out there in the political arena lately, I want to emphasize Medicare and Social Security are not handouts. (Applause.) You’ve paid into these programs your whole lives. You’ve earned them. And as President, it’s my job to make sure that Medicare and Social Security remain strong for today’s seniors and for future generations. I have strengthened Medicare as President. (Applause.) We’ve added years to the life of the program by getting rid of taxpayer subsidies to insurance companies that weren’t making people healthier. And we used those savings to lower prescription drug costs, and to offer seniors on Medicare new preventive services like cancer screenings and wellness services. In fact, the health reform law we passed has already saved more than 5.5 million seniors and people with disabilities nearly $4.5 billion on their prescription drugs. (Applause.) Seniors who received a discount have saved an average of more than $600 this year alone. And over the next 10 years, we expect the average Medicare beneficiary to save nearly $5,000 as a result of this law. Now, my opponents have pledged to repeal these savings and benefits in their first day on the job, which means billions in new profits for insurance companies, but also would mean immediately increased costs for seniors and would bankrupt the Medicare trust fund in just four years. And what would they replace it with? Their plan replaces guaranteed Medicare benefits with a voucher that wouldn’t keep up with costs. And when they tell you that their plan lets you keep your doctor, they’re leaving out one thing — and that’s the facts. A new study says that under their plan, if just 5 percent of seniors switch to private plans, 40 percent of doctors who currently take Medicare would stop accepting it. So think about that. Millions of seniors would be forced to change doctors. My opponent claims that to pay for a new $5 trillion tax cut skewed towards the very top, he’d just close tax loopholes for the very wealthy. But independent experts say there’s no way to do that without also cutting deductions that the middle class relies on, and that includes taxing things like Social Security benefits. And this could mean higher taxes for seniors on Social Security, including taxing benefits for seniors who make less than $32,000 a year for the first time ever. Nearly 30 million seniors could see their taxes go up by hundreds of dollars. So I want you all to know at AARP I’m not going to let that happen. (Applause.) My plan calls for both parties to come together and take responsible steps to preserve Social Security for the long run. And we’ll do it in a way that ensures a lifetime of hard work is rewarded with dignity and security for generations to come. Q Mr. President, Jane Pauley here again. I’m back in the hall with our members, and they do have some questions for you. I’d like to explain here in the hall that — what a satellite delay is. When I ask a question, it goes up there, and then it comes down. There’s about a second and a half delay between my delivering a question and the President hearing it. Just so you know the drill and a little inside stuff on television. Mr. President, we are so grateful that you can stay with us a few minutes longer. THE PRESIDENT: Well, it’s a great question, Mike, and I appreciate it. We have a genuine challenge in bringing our deficit down and reducing our debt, and I think it’s important for folks to know that 90 percent of the debt and deficits that we’re seeing right now are the result of choices that were made over the course of the last decade — two wars that weren’t paid for; tax cuts skewed towards the wealthy that were not paid for. So we made some decisions, and then when the Great Recession hit, that meant more money was going out and not as much money was coming in, and that has blown up our deficit and our debt. The key to reducing it is to do it in a balanced, responsible way. So I’ve put forward a $4 trillion, deficit-reduction plan which would bring our deficits down to a manageable level and begin the work of bringing our debt down, and it involves making some tough choices. So I’ve already signed a trillion dollars’ worth of cuts, programs that we don’t need, programs that, frankly, are not helping people get more opportunity or creating pathways for success for middle-class families or those who are striving to get into the middle class. Now, this contrasts with the plan that my opponent is putting forward for deficit reduction. And some of you may have seen President Clinton speak at the convention — (applause) — what’s missing from it is arithmetic, because what they’re proposing is not only to extend the Bush tax cuts for the wealthy, but then they want to add another $5 trillion tax cut on top of that, and $2 trillion in additional defense spending that our Joint Chiefs of Staff say doesn’t make sense at a time when we’re winding down two wars. So before they even start digging us out of the hole that we’re in, they just added to the hole with $7 trillion in additional spending on tax cuts or on defense. Now, they haven’t explained how they would pay for that, but independent analysts who have looked at it have said the only way you pay for this is not only to gut investments in education, in basic research that could help find cures for cancer or Alzheimer’s, to not invest in our infrastructure, but it also means that you’re going to have to impose a higher tax burden on middle-class families — up to $2,000 a year for families with children. And as I mentioned in my opening remarks, if you’re looking at figuring out how to pay for that $5 trillion tax cut, part of what you would also start looking at is taxing Social Security benefits, or turning Medicare into a voucher program. And that is not the right approach to take. My attitude is that if we’re going to work together to bring down our deficit, everybody has got to do their fair share, everybody has got to do their part. (Applause.) And for us to have new tax cuts for millionaires and billionaires to pay for cuts in Social Security or Medicare or education is just not the right way to go. THE PRESIDENT: I do think that looking at changing the cap is an important aspect of putting Social Security on a more stable footing. (Applause.) And what I’ve said is, is that I’m willing to work with Republicans and examine all their ideas, but what I’m not going to do as a matter of principle is to slash benefits or privatize Social Security and suddenly turn it over to Wall Street. Because we saw what can happen, back in 2008/2009, when the stock market crashed. And we’re still recovering from that. THE PRESIDENT: Well, the good news is, I’m not just talking about it, we’ve actually done something about it. (Applause.) The health care bill that we passed, Obamacare, which, by the way, I don’t mind the term because I do care, that’s why we passed the bill — (applause) — one of the things that we did was to begin closing the notorious doughnut hole that so many seniors suffer from. So starting this year already, what we’re seeing is a 50 percent discount for seniors who are in the doughnut hole. Each year they’re going to get additional discounts until the doughnut hole is completely closed. That’s already saving millions of seniors around the country an average of $600 to $650 a year. That’s on top, by the way, of the preventive care that is now provided without additional charge, under Medicare, as a consequence of what we did with Obamacare. And there’s more that we can do on prescription drugs. One of the things that I’ve proposed in my budget is that Medicare recipients should get some of the same deep discounts that Medicaid receives. That would save additional billions of dollars for seniors. (Applause.) And there’s work that we can also do in terms of accelerating the use of generics and making sure that the process for seniors getting access to cheaper prescription drugs is obtained. But this is critically important because I meet too many families where they tell me a story of their parents having to cut their pills in half because they just can’t afford the prescriptions that have been given to them. THE PRESIDENT: Well, again, it turns out that contrary to what you’ve heard and what you may hear from subsequent speakers, Obamacare actually strengthened Medicare. So what we did was extend the Medicare trust fund by eight years. In addition, we dealt with prescription drugs in a way that is helping seniors now and in the future. The preventive care that we’re doing is going to ensure that seniors stay healthier, which reduces costs. And one thing that I want to point out is, when you hear this notion of — that we somehow took $716 billion, robbed it from Medicare beneficiaries and seniors, I want you to know that is simply not true. (Applause.) What we did was we went after waste and fraud, and overcharging by insurance companies, for example. Those savings do come out to $716 [billion], and those savings are part of what allows us to close the doughnut hole, provide the preventive care, and is actually going to extend the life of Medicare over the long term. It also, by the way, helps to reduce the increase in the premiums that seniors pay under Medicare. Because this is not just a Medicare problem. Medicare actually is a very efficient program relative to the private insurance programs. The problem is health care costs generally are going up. So we’ve got to bring down health care costs; that’s what we’re focused on. And I just want to point out that the other side’s approach to saving Medicare — and you’ll be hearing about this, I gather, after I speak — is to turn Medicare into a voucher program and essentially transfer those costs onto seniors. Congressman Ryan’s original plan that was put forward — independent analysis showed that, as a consequence, seniors could expect to pay over $6,000 more for their Medicare once they were under a voucher program. Now, that was his original plan. I want to be fair here. He then modified it — because obviously there was a lot of pushback from seniors on that idea — so he said, well, we’re going to have traditional Medicare stand side by side with the voucher program, and no current beneficiaries will be affected. THE PRESIDENT: Well, this is a great question, and obviously one of the challenges that we’ve seen as a consequence of this terrible recession we went through was a lot of workers in their 50s and early 60s found themselves suddenly laid off, and it’s very hard for them to get their foot in the door despite all the incredible experience that they have and the skills and training that they’ve got. So there are a couple of things that we need to do. THE PRESIDENT: And that’s something that we’re really focused on. So I am always going to be looking to find common ground and solve problems for the American people. The one thing I won’t do, though, is to go along with bad ideas that are not helping the middle class, not helping people who have worked hard all their lives, not helping to provide ladders of opportunity to people who are still looking to succeed in this great country of ours. And so, if I hear that the only way that Republicans in Congress are willing to move forward is to voucherize Medicare, I’ll say no. (Applause.) If the only thing that they’re willing to offer in terms of deficit reduction is to do it on the backs of seniors or our children who need to get a great education, or middle-class families who can’t afford another tax increase, I’m going to say no. THE PRESIDENT: Thank you so much, Jane. Take care, everybody. Entering the Republican National Convention to ebullient cheers, Rep. Paul Ryan stepped confidently into the national spotlight as his party’s vice presidential nominee and promised that he and Mitt Romney would tackle the country’s most difficult problems to fix the economy and create millions of new jobs. THE PRESIDENT: Hello, New Hampshire! (Applause.) Thank you! A couple people I want to acknowledge. First of all, thanks to your outstanding young mayor, T.J. Jean — (applause) — and his folks, who are standing right next to him. They’re pretty proud of him. He’s doing a great job. Please give Amy a great big round of applause for the wonderful introduction. (Applause.) One of the national co-chairs of our campaign and your outstanding senator, Jeanne Shaheen, is here. (Applause.) And congressional candidate Carol Shea-Porter is here. (Applause.) And all of you are here — (applause) — on a beautiful Saturday. Now, first of all, I’ve got to just say thanks to all of you for looking after Malia and Sasha while they were up here. They were here for a month at camp, and they did a great — they just had a great time, and enjoyed all the water sports, playing basketball and tennis, and arts and crafts. And, most importantly, there was some ice cream involved in the thing. (Laughter.) They were quite pleased about that. So we missed them, though. Parents, it’s tough when your kids are away, isn’t it? (Laughter.) We’ve missed them so much. And they promised they’d write — and they did — and they’d just say, “We’re doing fine. Bye.” (Laughter.) It’s tough. THE PRESIDENT: — no, there’s nothing wrong with that. That’s good. (Laughter.) But unless you’ve been able to hide your television set, you may be aware that there’s a pretty intense campaign going on right now. Now, the reason it is so hotly contested is because the choice that we face this November couldn’t be bigger. It’s not just a choice between two candidates or two political parties. This is a choice between two fundamentally different visions for our country; two fundamentally different ideas about the direction that we should be going in. And the direction that we choose, the direction you choose when you walk into that voting booth in November is going to have an impact not just on your lives, it’s going to have an impact on your children, your grandchildren, and generations to come. Now, four years ago, we came together as Democrats, but also independents and some Republicans, because we knew we had to restore the basic bargain that built America — what made us an economic superpower, what created the greatest middle class we’ve ever seen. And it’s a pretty simple bargain. It’s the idea that if you work hard, you should be able to get ahead. It’s a deal that says if you put in enough effort and you act responsibly, that you can find a job that pays the bills; you can afford a home that you call your own; you can count on health care when you get sick; you can retire with dignity and respect; and, most importantly, you can give your kids the kind of education and opportunity that allows them to dream even bigger and do even better than you ever did. (Applause.) That’s the American idea. That’s what we came together to fight for in 2008. It’s a simple American promise. And we knew it wouldn’t be easy restoring that promise. We knew it would take more than one year or one term, or even one President, because we had gone through a decade in which that promise wasn’t being kept. THE PRESIDENT: I love you, too, sweetie. (Applause.) We had seen a decade, before I came into office, in which jobs were being shipped overseas. We had run two wars on a credit card, gone from surplus to deficits. Wages and incomes actually went down during this period, even as the costs of everything from health care and college were going up. A few folks at the top were doing really, really well, but for a lot of middle-class families, folks were working harder and harder, and seems like if you were lucky you were just treading water. And that was before the economic crisis, which hammered so many families all across this state and all across this country — people losing their jobs, their homes, their savings — making the American Dream even further out of reach. THE PRESIDENT: I’m not exaggerating here. You can go on their website, look at Congressman Ryan’s budget. The centerpiece of Governor Romney’s entire economic plan is a new $5 trillion tax cut, a lot of it going to folks like me, a lot of it going to the wealthiest Americans. His new running mate, Congressman Ryan, put forward a plan that would let Governor Romney pay less than 1 percent in taxes each year. THE PRESIDENT: That’s a pretty good deal, just paying 1 percent in taxes. You’re making millions of dollars. Now, here’s the kicker — they expect you to pick up the tab. Governor Romney’s tax plan would actually raise taxes on middle-class families with children by an average of $2,000. Now, this is not my analysis. This is the analysis of independent economists whose job it is to analyze these plans. Every media outlet has checked on the numbers here, and their estimate is that it would cost you an extra $2,000 — not to grow the economy, not to reduce the deficit, not to make sure that our schools are working well or we’re building roads or we’re strengthening the middle class. All this would be just to give another tax cut to folks like Governor Romney. It would give the average person who is making more than $3 million a year another $250,000 in tax cuts. THE PRESIDENT: Now, Governor Romney and Congressman Ryan will be here in New Hampshire on Monday, so you can tell them if you think this is fair. (Laughter.) And you should ask them, how do you think that’s going to grow the economy again? How is that going to strengthen the middle class? THE PRESIDENT: Now, the truth is, if you ask them or you ask their consultants, I think they know their economic plan isn’t really popular. (Laughter.) And that’s why they’ve got to be dishonest about my plan. They are just throwing everything they can at the wall to see if it sticks. Their latest approach is to try to challenge me on Medicare. Now, let’s just think about this for a second — Governor Romney wants to turn Medicare into a voucher system. Congressman Ryan wants to turn Medicare into a voucher system. Meanwhile, Governor Romney and Congressman Ryan want to give seniors a voucher to buy insurance on their own, which — again, somebody did the analysis; not us, somebody else — and they estimate that this could force seniors to pay as much as an extra $6,400 a year for their health care. THE PRESIDENT: How many people think that’s a good deal? THE PRESIDENT: That doesn’t strengthen Medicare. It undoes the very guarantee of Medicare. But that’s the core of the plan that was written by Congressman Ryan and endorsed by Governor Romney. And if they want to talk about benefits, they should be straight with you. Those new cancer screenings and prescription drug discounts, all those things we put into place with the Affordable Care Act, those things would be eliminated if Governor Romney had his way. So it would take something away from seniors and it wouldn’t replace it with something better. So here’s the bottom line, New Hampshire — my plan saves money in Medicare by cracking down on fraud and waste, and making sure insurance companies aren’t getting unfair subsidies. (Applause.) Their plan makes seniors pay more so they can give another tax cut to rich folks who don’t need a tax cut. THE PRESIDENT: My plan has extended the life of Medicare by nearly a decade. Their plan would shorten the life of Medicare and end Medicare as we know it, because they’d turn it into a voucher system. So those are the differences between our plans on Medicare. But that’s just one example of the choice in this election. That’s what’s at stake. That’s why I’m running. And you can see it on every issue. When it comes to taxes, four years ago, I came before you and I said middle-class families need relief, especially during this crisis; I’m going to lower taxes on middle-class families. Guess what? I kept that promise. (Applause.) So if you start getting into an argument with your Republican cousin or friend or what have you — (laughter) — you just tell them, look, the typical family is paying $3,600 less in federal taxes since President Obama came into office. (Applause.) And right now, what I want to do is I want to keep taxes right where they are for your first $250,000 of income. Now, that means — 98 percent of Americans make less than $250,000; 97 percent of small businesses make less than $250,000. So under my plan, you wouldn’t see your taxes — your income taxes go up a single dime next year. (Applause.) That’s a contrast with Governor Romney’s plan. But in the interest of full disclosure here, if you’re fortunate enough to be in the other 2 percent, you’re still going to get a tax cut on the first $250,000 of income. You get to keep that. All we’re asking is that you contribute a little bit more so that we can pay down our deficit in a responsible way and invest in things like education that help us grow. (Applause.) And you’ll hear some people say, well, just taxing the top 2 percent, that won’t eliminate the deficit. It’s true. Government is still going to have to do its part in cutting away spending we don’t need. And we’ve already cut a trillion dollars’ worth of spending, and we’re slated to do another trillion and a half under my budget plan. And part of the reason it worked out pretty well — when a teacher or a construction worker or a nurse or a receptionist, when they’ve got a little extra money in their pockets, what do they do? THE PRESIDENT: They spend it on basic necessities. And that means maybe that old beat up car you’ve been hanging on to for the last 12 years, you decide, all right, it’s time to get a new one. Or maybe you decide, you know what, our kids are going to college, let’s make sure they’ve got a new computer. And that means, then, business has more customers, which means business gets more profit, which means they then hire more workers, which means those workers then have a little more money in their pockets. Everybody does better. My opponent thinks new sources of clean, homegrown energy like wind energy are “imaginary.” That’s what he called them. (Laughter.) Congressman Ryan said they were a “fad.” Listen, since I took office, America has doubled the use of renewable energy. (Applause.) Thousands of good American jobs have been created. It’s helping us to reduce our dependence on foreign oil. That’s not imaginary, that’s real. We’re not going to put — we’re not going to go back to the days when serving the country you love depended on who you love. We ended “don’t ask, don’t tell.” It was the right thing to do. (Applause.) We’re not going backwards, we’re going forward. On issue after issue, there is a clear choice. Now, over the next three months, the other side is going to spend more money than we have ever seen. I mean, they are writing $10 million checks — individuals — just to run the same ad over and over again. It’s variations on the same theme, which is, the economy is not where it needs to be and it’s Obama’s fault. They’ll just say that over and over again. (Laughter.) And the reason they’ve got to say that — that’s their only message — is because they know their economic plan won’t sell. God bless you. God bless the United States of America. Thank you. Well, first all, thank you guys all for being here. I know it’s a little bit warm. THE PRESIDENT: I love you back. (Laughter.) So for those of you, everybody who is standing, I want you to kind of bend your knees a little bit. (Laughter.) We usually see a few folks kind of dropping out a little bit when it’s this warm. If you’ve got a seat, feel free to sit down and relax. I want everybody to give a big round of applause to Beth Talbot — (applause) — not only for the great introduction, but for being an outstanding teacher. I love teachers. (Applause.) Love them. Now, while they were at camp — there are no TVs at camp — but unless you’ve been able to hide your TV set or your cable is broke, you may be aware that there is a campaign going on right now. (Laughter and applause.) And part of the reason the campaign is so intense is because the choice we face in November could not be bigger. It’s not just a choice between two candidates or two political parties, it is a choice between two fundamentally different visions about where to take the country; two fundamentally paths for America. And the decisions that you make, the direction you choose for us to walk in when you walk into that voting booth in November, it’s going to have an impact not just on your lives but it’s going to have an impact on your kids and your grandkids and generations to come. Some of you were involved in 2008 when we came together. (Applause.) And it wasn’t just Democrats — we had independents, we had even some Republicans. THE PRESIDENT: There you go. (Laughter.) 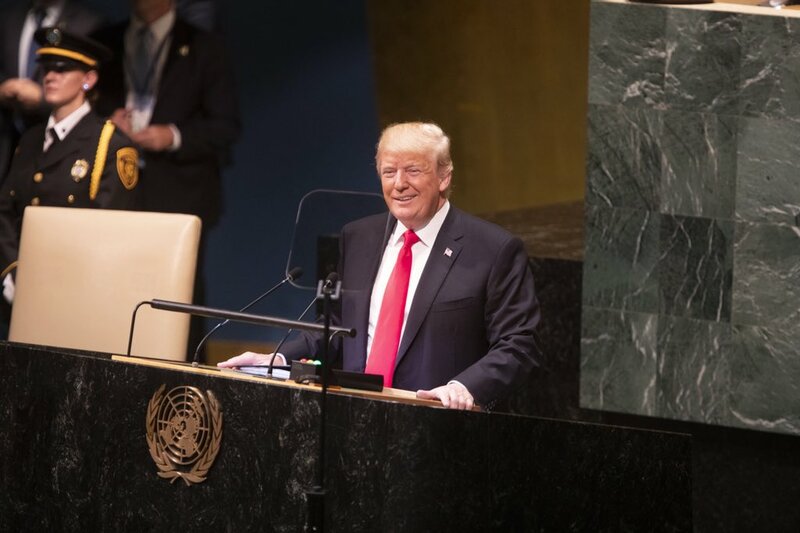 And the idea was that we needed to restore the basic bargain that made this country great; the basic bargain that created the most prosperous economy that the world has even known. That’s the American promise. That’s the American Dream. And we knew restoring it wouldn’t be easy; that it would take more than one year or one term or even one President, because we had gone through a decade in which that promise was not being kept. We had seen a decade in which incomes and wages were going down even as the cost of everything from health care to college were going up. AUDIENCE MEMBER: Say it again, Mr. President, so we can hear it again! THE PRESIDENT: We had seen a decade — (laughter and applause) — in which jobs were being shipped overseas, in which we took a surplus and turned it into a deficit, ran two wars on a credit card — all culminating in the worst financial crisis since the Great Depression. And middle-class families who were already getting hammered lost their jobs, lost their savings, some lost their homes. And the American Dream seemed even further out of reach. Most of all, the American character has not changed. In fact, we saw during this crisis how people may have gotten knocked down, but they got right back up. (Applause.) Folks — people in their 50s, 60s losing their jobs, go back to school, they get retrained and find a new one. Small business people keeping their doors open even if it meant them not taking a salary, because they understood their workers had families that were depending on them. We may have gone through tough times, but it turns out we’re tougher than tough times. (Applause.) And that’s how we saved an auto industry on the brink of collapse. That’s how we created 4.5 million new jobs, half a million in manufacturing. THE PRESIDENT: Now, I’ve got to say — remember, I said this is a choice in this election. We’ve got a particular vision about how to move the country forward. My opponent and his running mate have a very different view. They believe the best way forward is to go right back to the old top-down economics that got us into this mess in the first place. THE PRESIDENT: — he put forward a plan that would let Governor Romney pay less than 1 percent in taxes each year. And here’s the kicker — he expects you to pick up the tab. THE PRESIDENT: — not to reduce the deficit, not to grow jobs, not to invest in education, but to give another tax cut to folks like him. Now, ask Governor Romney and his running mate when they’re here in New Hampshire on Monday — they’re going to be coming here on Monday — ask them if that’s fair. Ask them how it will grow the economy. Ask them how it will strengthen the middle class. Now, the truth is I think they know it’s not a very popular idea. You can tell that because now they’re being dishonest about my plans, since they can’t sell their plans. (Laughter.) I mean, they are trying to throw everything at the wall just to see what will stick. The latest thing they’ve been trying is to talk about Medicare. Now, you would think they would avoid talking about Medicare, given the fact that both of them have proposed to voucherize the Medicare system. Governor Romney and Congressman Ryan have a very different plan. What they want to do is they want seniors to get a voucher to buy their own insurance, which could force seniors to pay an extra $6,400 a year for their health care. THE PRESIDENT: Again, this is not my estimate. Remember those guys who analyze these things for a living? That’s their assessment. That doesn’t strengthen Medicare. That undoes the very guarantee of Medicare. That’s the core of the plan written by Congressman Ryan and endorsed by Governor Romney. So here is the bottom line: My plan saves money in Medicare by cracking down on fraud and waste and insurance company subsidies. (Applause.) And their plan makes seniors pay more so they can give another tax cut to millionaires and billionaires. THE PRESIDENT: My plan has already extended the life of Medicare by nearly a decade. (Applause.) Their plan would put Medicare on track to be ended as we know it. It would be an entirely different plan — a plan in which you could not count on health care because it would have to be coming out of your pocket. That’s the real difference between our plans on Medicare. Now, if you’re fortunate enough to be in the other 2 percent, you’ll still keep your tax cut on the first $250,000 you make. That’s a pretty good deal. But all we’re asking is for folks like me who make more than $250,000, we’re asking that you contribute a little bit more above $250,000 so we can pay down this deficit and invest in things like making college more affordable — (applause) — making sure our teachers aren’t laid off, making sure our firefighters are there to respond to emergencies, making sure our economy grows. And, keep in mind, asking the wealthy to pay a little bit more, that doesn’t eliminate our deficit. We’re still going to have to make sure that government does its part by cutting away all the spending we don’t need. And I’ve already cut a trillion dollars in spending, and we’ve slated another trillion more. See, I’m getting all fired up. (Applause.) And I want to explain that this is not just good for middle-class families and working families, it’s good for everybody. Because what happens when a police officer or a firefighter or a teacher or a construction worker or a receptionist — what happens when they’ve got a little more money in their pocket? Governor Romney likes to tout his private sector experience, even though a lot of that experience was investing in companies that were called “pioneers” in the business of outsourcing manufacturing jobs. Governor Romney thinks new sources of clean energy are “imaginary.” Since I took office, we have in fact doubled the use of renewable energy like wind and solar. Thousands of Americans have good jobs because of it. It’s not imaginary, it’s real. In 2008 I promised I would end the war in Iraq — we did. (Applause.) I said we’d go after al Qaeda and bin Laden — we did. (Applause.) We now are transitioning so that Afghans take more responsibility for their security and we can start bringing our troops home from there. (Applause.) All of these things we did only because of the incredible courage and dedication and patriotism of our men and women in uniform. (Applause.) And that’s why we’ve made historic investments in the VA — because I believe that anybody who has fought for America in uniform should not have to fight for a job when they come home — (applause) — shouldn’t have to fight for the benefits they’ve earned. Now, let me say this — let me close up by saying this. Over the next three months, you will see more negative ads than you have ever seen in your life. These folks on the other side, they’re writing $10 million checks. And basically, their argument is going to be the same one over and over again: The economy is not where it should be, and it’s Obama’s fault. They’ll just keep on repeating it because they know their own plans don’t sell. So all they’ll try to do is just hope that if they can tap into people’s frustration and anxiety, that somehow they’re going to win, even though what they’re selling won’t work. It’s not — what they’re selling is not a plan to create jobs, it’s not a plan to reduce the deficit, it certainly is not a plan to revive the middle class. But they are counting on just outspending us to win. But here is the good news. Here is the good news, New Hampshire — I’ve been counted out before and I’ve been outspent before. But what I’ve learned — and you guys helped teach this to me — is that when the American people, when they cut through the nonsense, when you focus on what’s important, when you’re reminded of what values built this country, when you remember that we are all in this together, and you affirm the basic American notion that everybody in this country gets a fair shot and everybody should do their fair share, and everybody should play by the same set of rules — when you are focused on the things that make us a great country, we don’t lose. (Applause.) You will help get us there. Mitt Romney took another crack at resetting the Medicare debate on Thursday, calling an impromptu press conference on the tarmac of a South Carolina airport. With a black marker in his hand and a whiteboard to his side, the Republican presidential candidate tried to spell out, literally, the differences between his and President Obama’s policies. “My plan stays the same. No adjustments, no changes, no savings,” Romney said. Paul Ryan had a second homecoming Wednesday, returning to his alma mater, Miami University, where he took on the issue of Medicare. The subject is one which Democrats are using to frighten senior voters in hopes to derail Mitt Romney’s campaign now that Ryan, the House budget chairman, has joined the ticket. But Ryan is playing offense. Mentioning Medicare for the first time on the stump, he repeated a line of attack introduced earlier in the week by the Romney campaign.